Madison Valley is a Seattle neighborhood located just east of Capitol Hill and the Central Area, south of Madison Park and north of Madrona. A new-old community, it is best located at the small business district near Madison Street and Martin Luther King Jr. Way. According to community leaders, its boundaries are Madison on the north, Lake Washington Boulevard and Dorffel Drive on the east, 23rd Avenue E on the west, and Denny Way to the south. The community, at one time a deteriorating hollow that affluent Madison Park and Denny-Blaine residents hurriedly drove by, has changed. Today the neighborhood is festooned with small parks, two greenbelts, a pea patch, three schools, craftsman-style houses, and a cozy upgraded business district that boasts several of Seattle’s best neighborhood restaurants. The last of the great glaciers, the Vashon, shaped Seattle’s Lake Washington neighborhoods, including Madison Valley. Earthquakes and floods added to the sculptured effect of the land and left the soil relatively unstable. The valley itself, once the bed of an ancient salmon stream that emptied into Union Bay, is fertile. The steep hillsides have been subject to landslides, a problem noted by residents over many years. After the hamlet of Seattle was established in the mid-1850s, white settlers followed ancient Indian trails to fish, shoot bear, cougar, and deer, and to explore the pristine shores of Lake Washington. A few newcomers spent more time at today’s Madison Park, which led to the interest of several prominent citizens. 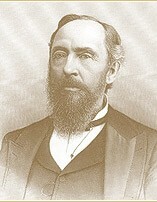 Judge John J. McGilvra (1827-1903), a former Illinois resident, acquired 420 acres of land at Madison Park in the 1860s. He paid $5 an acre when sections of the school land were sold to finance the new University of Washington. To reach his far-away claim, McGilvra cut a straight rough road through the woods. Today, Madison Street, a diagonal path across Seattle’s traditional east-west and north-south streets, is the only direct vehicle route between salt water (Elliott Bay) and fresh water (Lake Washington). McGilvra established his residential retreat, “Laurel Shade,” at Madison Park and put several lots up for sale. 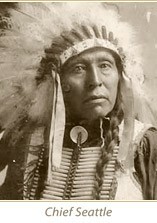 He then donated 24 acres for public use – today’s Madison Park. The rough road Judge McGilvra established became a popular public by-way. Wagons, horses, and hikers all tramped along its forested route. With the sale of lots and the eventual establishment of a “tent city” for summer visitors, Madison Park became a destination for vacationers. Wagner’s band played Sousa marches on a barge, Seattle’s first professional champion baseball team scraped out a playing field, Captain John Anderson’s “Mosquito Fleet” steamboats made regular stops. The increased activity at the lakeshore caused McGilvra and friends to found the Madison Street Cable Railway Company. In summer the cars ran every two minutes. During rainy winter months removable glass panels protected the passengers. The cars themselves were covered with advertisements. Construction of the cable railway resulted in more right-of-way clearing and the building of a large trestle through the core of Madison Valley. The valley was then a “pass-through” area, despite its wild salmon stream and lush growth. Passengers enjoyed the view, but were looking forward to reaching the waters of Lake Washington. When the Olmsted brothers were hired by the city in 1902-1903 to design parks and boulevards in anticipation of the 1909 Alaska-Yukon-Pacific Exposition, they suggested bypassing Madison Park. Judge McGilvra’s settlement had become a somewhat raucous amusement center. Lake Washington Boulevard was then routed uphill from the lake through what is now called Lake View Park. The new route more or less followed Harrison Street, through the fringes of Madison Valley, into what is today’s Arboretum. The route was to be a southern entrance to the Alaska-Yukon-Pacific grounds on the University of Washington campus. At about this time the Madison Street trestle over the stream was replaced by an earthen dam and became a permanent road. The rushing salmon stream dried up, the remaining trickle was routed through a pipe, and Madison Valley residents were cut off from Union Bay and from the wild growth that would become the Arboretum. Several “outside” events affected Madison Valley shortly after the Alaska-Yukon-Pacific celebration. First, the Lake Washington Ship Canal (which connected Lake Washington with Lake Union and Puget Sound) was opened in 1917. The waters of Lake Washington flowed into Lake Union through Montlake Cut, causing Lake Washington to drop by about nine feet. A new shoreline appeared, enhancing both private and public holdings. This dramatic lakefront change increased traffic to lakeside parks for recreation and to buy lots. That activity tended to bypass Madison Valley. Secondly, with the advent of America’s entry into the World War I (1917-1919), new, modest housing was built in the valley for the influx of shipyard and other workers. The new housing spurred economic growth in the valley and in nearby communities. Madison Valley residents watched the Puget Sound Mill Company deed a 62-acre tract to the city in 1920 for the genesis of an arboretum. They had to watch, however, from the other side of a Madison Street earthen wall. Despite having its access restricted by the former cable car trestle, the Madison Valley community nevertheless showed great interest in the wild area that had once been its stream bed and access to Union Bay. That interest continues today. The earliest version of the Arboretum boasted a formal rose garden where today’s soccer field lies. During that same time scenic Azalea Way was used as an informal horse racing track. In time, the city made a deal with the University of Washington to expand the Arboretum to 260 acres. The tract was designed to accommodate every plant and shrub indigenous to the Pacific Northwest. In the late 1990s, an Arboretum Master Plan was presented and debated. Among those showing particular interest in this matter are residents of Madison Valley. Schools have played a central role in the life of Madison Valley. The following three schools are or were within the Madison Valley community, but nearby Edmond S. Meany Middle School and Garfield High School are equally important to young Madison Valley residents. Harrison School was constructed in 1913 to accommodate the families of workers, many of whom were employed in industrial and shipyard work then and during World War I. When the war ended and population patterns shifted, the school was closed in 1932. It reopened in 1936 as Harrison Grade School. The Harrison P.T.A. served as the genesis of community involvement and action and led to the formation of a community council. In 1974, pupils at the adjoining Harrison Early Childhood Center voted to change the Center’s name to Martin Luther King, Jr. A subsequent school-wide poll resulted in the entire school being renamed Martin Luther King Jr. Elementary School. In 1996, an 80th year reunion was held, attended by a large community gathering. Valley School is a private elementary school that has existed for 10 years as of 2001. The first version of Lakeside School (after a brief period as Moran-Bainbridge on Bainbridge Island) occurred in Denny-Blaine on the 300 block of 39th Avenue E, next to Lake Washington. In 1923, Lakeside moved to the present site of Helen Bush School, in the center of Madison Valley. Lakeside later relocated to north Seattle. Helen Taylor Bush opened her Denny-Blaine home at 133 Dorffel Drive as a school with six students. Her emphasis on the sciences, nature, and fine arts attracted parents and students, causing her classes to outgrow her home. Bush then rented the former Lakeside School buildings on Harrison and Lake Washington Boulevard. Today, the Bush School has 11 buildings on a nine-acre campus and occupies the same long east-west block as the Martin Luther King Jr. Elementary School. Madison Valley’s history is interwoven with the color green. The original valley was a wooded verdancy with a meandering stream. Hillsides were covered with trees and the Arboretum was a next-door attraction. The neighborhood’s unflagging interest in the Arboretum and its two greenbelts – constantly threatened by either nature or property owners – is enhanced by several parks. A walk through Madison Valley can be a park-by-park adventure. Denny-Blaine Lake Park, officially named Minerva Park for co-developer E. F. Blaine’s wife, is considered by many to be Denny-Blaine country. However, the eastern boundary of Madison Valley often stretches to Dorffel Drive, which is the eastern boundary of this quaint little pond and charming METRO station designed by Ellsworth P. Storey, a nearby resident. Lake View Park was created by the Olmsted Brothers, landscape architects. 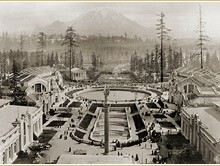 It was part of a Seattle system of parks and roadways leading to the 1909 Alaska-Yukon-Pacific Exposition. The land and its scenic knoll were acquired by both gift and condemnation proceedings. It was designated a “resting spot on the parkway” (Lake Washington Boulevard) and once sheltered a clay tennis court. Plum Tree Park on 26th Avenue between East Howell and East Olive streets was established in the early 1980s with Forward Thrust money. It has a basketball hoop, grassy patch, sandy play area, and benches made from telephone pole stubs. William Grose Park, at 30th Avenue between Denny Way and Howell Street, is an 18,700-foot mini-park named for African American pioneer William Grose (1835-1898). 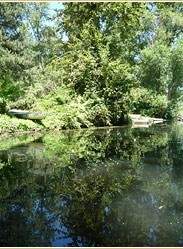 Funds from Forward Thrust and the Washington State Interagency for Outdoor Recreation were used to construct the park. Grose ran a famous restaurant and hotel in downtown Seattle called “Our House.” He is credited with establishing the Central Area core – and first Seattle African American neighborhood – when he bought a “ranch” bounded by 24th and 27th avenues and Howell and Olive streets. Julia Lee’s Park was established on the southwest corner of East Harrison and Martin Luther King Jr. Way in 1993. It is a memorial to native Seattleite Julia Lee Roderick Knudsen, built on private property by her husband C. Calvert Knudsen. The park holds an Italianate garden with handsome wooden benches and has become a green and peaceful meeting place for Madison Valley residents of all ages. Prentis Frazier Park (0.3 acres), formerly known as the Harrison Street mini-park, was established as a memorial to an African American businessman, newspaper publisher, and active member of the Republican Party. A more recent neighborhood green victory was the city’s purchase of a small hillside greenbelt below 3001 Madison Street. In May 2001, the backside of that area – 30th Avenue and Mercer Street – was cleared and cultivated by Madison Valley green-thumbers as a Pea Patch. A portion of that terraced Patch has been set aside for the Food Bank. The organized voice of the Madison Valley community emanated from the Harrison School P.T.A. It was later re-formed as the Harrison-Denny Community Council, and today is called the Greater Madison Valley Community Council. Its public organ, a spry and well-edited publication, began as a one-sheet publication called The Harrison-Denny Community Newsletter. Today’s newsletter, called The Valley View, focuses on a wide range of community issues, with special attention given to parks, greenbelts, and the recently inaugurated Pea Patch. In the 1980s and early 1990s, the newsletters were concerned with crime, especially street drug deals. Madison Valley’s presence within Seattle’s eastern precincts has never been clear. Madison Valley residents have on occasion felt like urban orphans. After being ignored by the Madison Park cable car people, then having a huge land barrier replace the trestle, the hollow itself fell into economic decline. For example, in the 1940s, residents identified neighborhood brothels and had to live amidst abandoned houses. Surrounding neighborhoods – Madrona, Denny-Blaine, Madison Park – seemed to take off. Madison Valley was left behind. By the 1950s, many Madison Valley’s residents were African American. African American neighbors referred to the area as “The Hollow.” During the 1960s and 1970s, the turmoil of the times affected the neighborhood. At this time “white flight” took place, as whites moved to the suburbs. The headquarters of the Black Panther Party was located in Madrona, just 10 blocks away from Madison Valley. So the neighborhood did not miss out on the Civil Rights movement or any of the other momentous events of those times. The neighborhood has been ignored and occasionally maligned. In 1992, the community suffered the indignity of not being shown on a city map of the Central Area. That was corrected. A couple of years later, the only church within the area – the Washington Park Baptist Church – was razed without a word to the community by the landowner preparing his property for an apartment house. Despite setbacks, the economic, racial, and religious diversity of Madison Valley may have caused it be an ideal urban neighborhood. The roots of that diversity are long and interesting. For example, in the early 1900s there was a community of Finns living in the valley. Many Finns and other Nordics built craftsman-style houses nearby. A Finn Hall was established at the southwest corner of Lake Washington Boulevard and Madison Street. The Hall was the scene of popular dances and theater performances. Among the star performers was Rosa Lemberg, known as “Rocy.” She was the daughter of a South African mother and an English father. Raised in Finland, Rosa became a first rate thespian and was referred to as the only “black Finn” her countrymen had ever seen. Another once famous valley resident was Mississippi-raised John H. “Doc” Hamilton, African American owner/manager of Seattle’s famous speakeasies during Prohibition. Doc was a veteran of the famous 92nd (Buffalo) Division in World War I. His establishments were patronized by a spectrum of local citizens, including Seattle’s white elite families. Seattleites who knew him well described his sense of humor, engaging manner, and business acumen. His businesses had many names, including the famous Barbecue Pit at 908 12th Avenue. Doc’s European-style home at 417 29th Avenue E, Madison Valley, is an excellent example of good Seattle living. Following a fracas in his bar, several of Doc’s “good friends” turned him into authorities. He served a brief term in prison and later died alone in Chinatown’s Mar Hotel on September 8, 1942. The Greater Madison Valley Community Council supports an annual rummage sale and spaghetti dinner, events that are often held at Martin Luther King Jr. School or at the Bush School. The Council also mounts occasional tours of craftsman-style houses and candlelit gardens, and publishes The Valley View. The community’s voice has been raised about myriad Central Area issues. Greenbelts remain important, but so do safety, schools, housing, and renovating the Arboretum field house. Neighborhood territorial views remain breathtaking, and since the introduction of METRO service on Martin Luther King Jr. Way, residents can get into their green enclave with relative ease. Madison Valley real estate values have risen dramatically. In 1997, a Village Schools Partnership was formed of Martin Luther King Jr. Elementary School, Edmund S. Meany Middle School, and the Greater Madison Valley Community Council. The Partnership’s theme is “… building cross-cultural and multi-generational community bonds.” That is a fair description of the state of Seattle’s Madison Valley.